A desktop program to upload files to file hosters can often be more comfortable than having to use the hoster's website for the uploading. It does depend on the program though. Some of the comfortable programs that we have reviewed in the past include the file hosting upload manager File & Image Uploader and File Uploader. 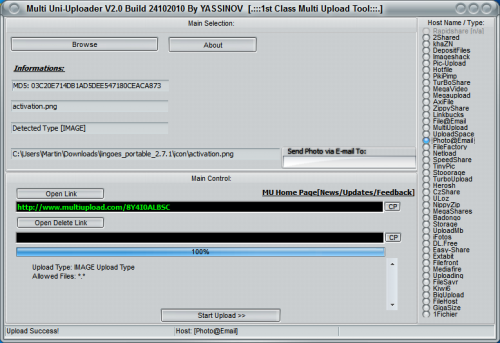 Multi Uni Uploader is another program for that purpose. The free software supports dozens of different file hosts, including popular choices such as Imageshack, Hotfile, 2Shared, Mediafire or Easyshare. The application displays all controls in the main interface. Actually, the only other menu available is the about menu. Everything else is handled in a single window. To upload files, the user picks one of the supported file hosting services. It is possible to pick a single hoster from the list, or a service like MultiUpload, which distributes the file to multiple hosters. For some file hosters, the file type needs to be specified before the upload. The app displays the supported file types of the selected hoster in the log area. Only single file uploads are supported. Files are added via the browse menu. Multi Uni Uploader will automatically calculate the MD5 hash of the file. A click on Start Upload sends the file to the hoster. Links are automatically retrieved and displayed in the interface so that they can be copied easily to the clipboard. This can be done manually, or by clicking on the CP button in the interface. Multi Uni Uploader is an easy to use software to upload files to file hosters on the Internet. Some features would make the program more interesting, like abilities to batch upload files, configure proxy and connection settings or a history to keep track of uploaded files. The portable software is available at the developer's homepage over at Blogspot.. Thanks Martin for your care about this software! i want to say that already some features have work in progress & will be added soon & the rest will come in next updates ! Feedback , suggestions , reports & comments are very useful & helpful for developper work progress !